It was a go from the minute I knew we'd be in Charlotte. I'm sure you've gathered by now: I'm a UMBC alumnus. But as a matter of context, not credentialing, I'm going to do something I don't often do: Lay all of my bona fides on the line. 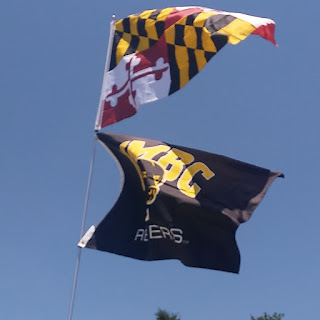 I attended UMBC from 1999-2003. I played four years in the pep band, attending virtually every basketball game, including those over break I had to drive back down from home in Delaware for. I'm married to a UMBC alumna. The processional at our wedding was Our UMBC, the alma mater, despite it having come into being after we both had graduated. I serve on the pep band alumni board of directors, and continue to give back to my alma mater. If I'm not mistaken, I've attended every postseason trip of any of our programs to North Carolina: men's lacrosse at Carolina, baseball at Wake Forest, men's soccer at Wake and again in the College Cup, and our previous NCAA men's basketball tournament trip in 2008. You could say I'm bought in. UMBC has no Wal-Mart t-shirt fans. No one - until perhaps last weekend - picks up UMBC apparel because it's the cool thing to do. We're "An Honors University in Maryland" - a nerd school outside of Baltimore that objectively sits next-tier-down from the flagship in a state system in terms of resources and notoriety. So if I see someone in a UMBC shirt or hat, I know, whether you're an alumnus, current student, family member, or employee, we share some piece of a common experience. Last weekend's experience is undoubtedly the best live sporting event of my life, and shy a championship, it may very well go unmatched. But one of the things that I saw bring so many people I know together had nothing to do with basketball. It wasn't a shared love of UMBC basketball, but in it the crystallization of a shared love of UMBC. Some have asked when I knew a victory was assured, and it's tough to say. I specifically recall noting the start of the "fourth quarter" - the 10 minute mark in the second half - and feeling confident in our 16 point lead. At that point, a loss would have been a choke job on our part, which seems counterintuitive of a 16 seed playing a 1. But I've also spent a lifetime as a Philly sports fan, so I'm not willing to acknowledge a sure thing until it is indeed that. The overwhelming feeling of that weekend, particularly that night, is one of pride. Pride in my university, pride in the men who took the court, pride in my pep band, who held their own against a pair of Power 5 programs with marching bands to pull from, pride in the UMBC faithful who were there in Charlotte and the many more who experienced it in a variety of other ways. I'm also humbled by the fact that for so many folks, I was the one who you thought of when you thought of UMBC, and the one who got the call, the text, or the wall post. My voice still has not fully recovered from last weekend. I shouted chanted, and barked more than was healthy. A friend commented that she could hear me on her TV and was legitimately unsure if she meant figuratively or literally. I sang the fight song and alma mater more than I ever did as a student - the former because I was typically playing it, and the latter because it didn't yet exist. While a trip to the second weekend would have been sweet (pun fully intended), no one can take Friday night away from us. I can fully acknowledge that in a lot of ways, sports are frivolous, but they have a power to galvanize like no other. While the basketball team was an inextricable part of my college career, there were many others for whom it was not who were still brought together by this experience. Make no mistake - we're proud of our talented alumni, our brief but important history, our exceptional president, but this experience was unlike any other. Sure, the visibility provides a certain external validation that doesn't always come from the mainstream with other accomplishments, and I think having everyone else see the amazing university we already knew is part of it. But there's a way that one's alma mater - that our alma mater - is tied into our sense of self that makes this victory on the court all of ours. The four letters on my shirt have always meant a lot to me, but only in the past week have others began to take note. I've always rocked UMBC gear, but now it's getting comments. Visitors to my office take note of the degree that hangs over my left shoulder and mention the game. The cynic in me mentally notes that I've been wearing this same gear for nearly two decades and the institution didn't get exponentially better because of the singular accomplishment of our team, but I can't sit here and act as though it meant nothing when I experienced firsthand how it made me feel.